Time to play hooky! 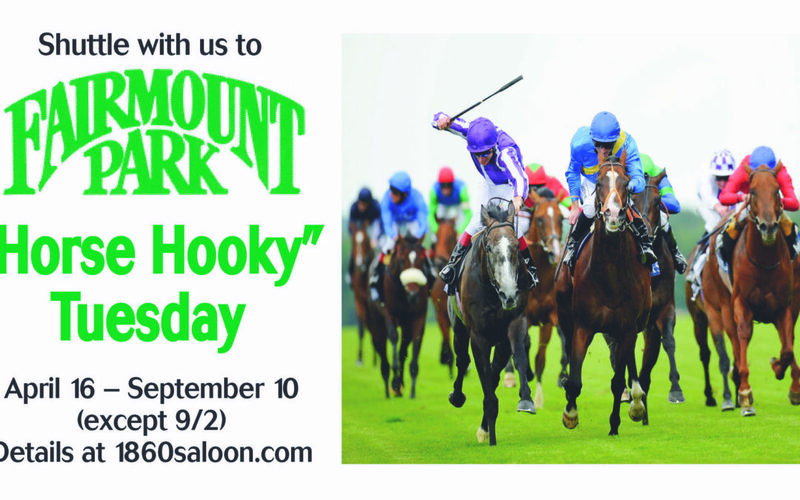 Horse Hooky, that is. Every Tuesday afternoon, now through the summer, ride the shuttle with us to Fairmount Park! Park free in Historic Soulard, either in our lot across from 1860s or along the neighborhood streets. And upon return, enjoy a meal or appetizers with refreshing beverages, served by our friendly staff. We look forward to playing hooky with you! 1860s: Where fun happens! 3 Great Experiences in one place! There are three rooms (with one menu) at 1860s. In the 1860s Saloon, with its antique wood back bar, live music with no cover charge is enjoyed 365 nights a year and weekend afternoons. Blues, Classic Rock and Motown performances ensure great entertainment. In the second room, groups converge at the 1860s Game Room bar for sports on the screens, foosball, video games, shuffleboard and darts. It’s the perfect atmosphere for drinks, St. Louis-style pizza, and listening to TouchTunes. Want traditional restaurant style seating? Room three, The Hardshell Café, with a New Orleans courtyard feel, is the place to be. During nice weather, relax at a table outside the café. We take reservations for groups Monday through Thursday in the Hardshell Café, 314-231-1860. From Cajun and Creole to traditional American fare, our menu items receive rave reviews. 1860saloon.com for menu, live music schedule, etc.